Women's soccer capture must-win match and gets some help to qualify for playoffs in their final game. In their final match of the regular season, women’s soccer visited the Holy Names University Hawks in Oakland, Calif. on Nov. 4. The Eagles needed a win to have a chance of finishing within the top five in the PacWest as well as to qualify for the National Christian College Athletic Association Playoffs. They did just that, with a 4-0 win over HNU, including two goals from sophomore forward Annmarie Alvarez. The Eagles got off to a fast start when senior forward Samantha Verduzco got on the end of a corner kick and passed the ball to junior defender Madyson Brown. Brown fired the ball into the net, giving Biola the 1-0 lead 10 minutes in. Two minutes later, the Eagles added to the scoreboard once more. Hawks goalkeeper Alyssa Lopez saved a shot from sophomore forward Paula-Marie Labate, but the rebound went straight to Alvarez, who put the ball in the open net to make it 2-0. Alvarez came close to scoring again in the 17th minute when her shot beat the keeper but hit the post. Alvarez did find the back of the net once more in the 36th minute. Senior midfielder Janae McGordon found Alvarez with a pass, and the sophomore finished her chance to make it 3-0 before halftime. Head coach Erin Brunelle began rotating the lineup in the second half to give more players minutes, which included switching out sophomore goalkeeper Christina Rodriguez for her backup, sophomore Alyssa Joel. The Eagles earned a corner kick after Verduzco’s shot was blocked out of bounds. Sophomore defender Colie Martin took the corner kick and found senior defender Cat Newberry outside of the box. Newberry launched a 25-yard shot into the net for her first goal of her Biola career, extending their lead to 4-0. The Hawks barely challenged goalkeepers Rodriguez and Joel, but they did hit the post in the 90th minute. The Eagles held their opponents to only one shot on goal for their third straight shutout win. The 4-0 score is Biola’s biggest margin of victory this season. 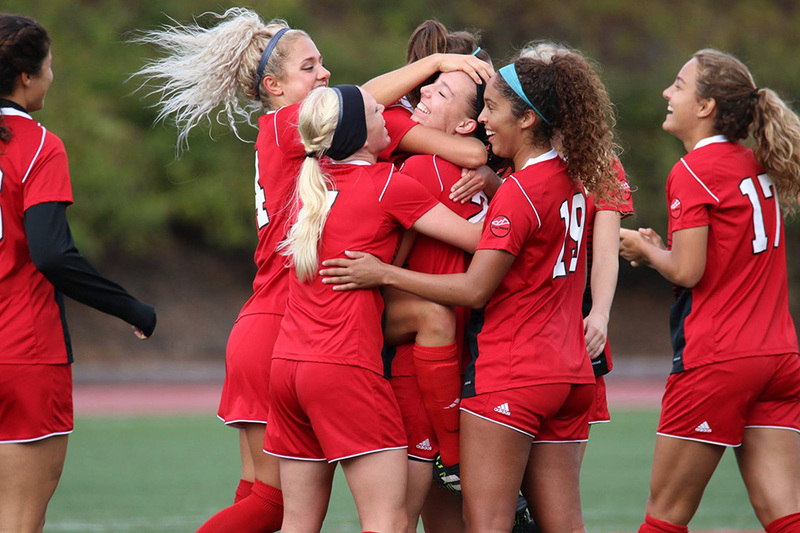 The win improves Biola’s record to 12-3-2 on the season (8-3-2 in the PacWest). Thanks to Dominican University beating Concordia University Irvine 1-0 on Nov. 4, the Eagles qualified for the NCCAA Playoffs with their win, as well as a fourth place finish in the PacWest. The Eagles will play in the NCCAA West Regional Championship match against Ottawa University Spirit on Nov. 11 at Al Barbour Field.